the Blackest Forest Gateau and a Giveaway! I came to baking and food relatively later in life--okay, but I'm not that old, so it really is relative--so a lot of things are still new for me. Like rhubarb, for instance. I'd never even heard of the stuff until college, and it's taken me this long after college to even man up and try it. I mean, I've heard the virtues of rhubarb extolled many times before, but it was really reminiscent to the unknowledgeable me of celery, which doesn't really scream "yummy dessert!" for me. But, at last and finally, I have gotten down to trying the classic combination of strawberries and rhubarb. I decided for my first experience with rhubarb, that I should go with something classic, so I chose the super-homey, tried-and-true strawberry rhubarb crumble. Not to say that super-homey and tried-and-true is anything bad at all. In fact, it was delicious. Like any good academic, I of course did my homework first by researching rhubarb and how it's used in baked desserts. For one, I discovered that you can't cook rhubarb in cast iron skillets, though, had you could, that would have made for one awesome photo. Then, while reading up on rhubarb in Alice Waters' Chez Panisse Fruit (wait, is rhubarb really a fruit? ), I came across this little tidbit from the ever-wise Alice Waters: rhubarb goes lovely with oranges. So, may I present to you, strawberry rhubarb crumble, flavored with orange zest. And, by the way, Alice Waters was so right. Orange is the perfect citrus accompaniment to the combination of strawberry and rhubarb. It's just acidic enough to add that bit of tartness, but, unlike lemon, orange is also sweet, which compliments the rhubarb really well and adds just that extra depth of flavor to the whole dish. Now, I may be new to rhubarb, but I'm not new to crusts, and I have to say that the crumb crust on this crumble *almost* outshines the strawberry rhubarb +orange filling inside. The crumb, too, is spiked with orange zest, and the brown sugar and butter with just a hint of salt makes for a perfect contrast to the sweet, sticky insides of the crumble. I layered the crumb topping on thick for a solid filling-to-crumb ratio so that you can get a good taste of everything in just one bite. Yup. Make sure to serve this baby with a scoop of vanilla ice cream or some sweetened heavy cream. Not that it needs it, but it sure doesn't hurt! Oh, and by the way--I think I'm calling this one a success with rhubarb. Now, what else can you do with this celery-like "fruit"? Tell me your ideas in the comments! 2. Make the filling first. Toss and combine all of the filling ingredients in a bowl. Spoon into the baking ramekins and set aside. 3. Make the crumb topping. Combine all of the ingredients except the butter in a bowl. 4. Using a pastry cutter or fork, cut the butter into the flour mixture. Continue until the butter is the size of small peas and evenly distributed throughout the mixture. 5. Top the prepared ramekins generously with the crumb topping, patting it down if you need to pile more on. 6. Bake for 30-40 minutes, until bubbly and the tops are golden brown. Remove and let cool briefly before serving. 7. Serve hot, with vanilla ice cream or a splash of sweetened cream. You can reheat the crumbles if you don't plan to eat them right away: 375 degrees F oven for 8-10 minutes. Tip: A large star piping tip makes for a great strawberry huller. Tip: You want to consider putting a thin cookie sheet or piece of aluminum foil on the oven rack underneath the one the crumbles are baking on, if you have the tendency to overfill them like I do. It makes it much easier to clean up. gorgeous! 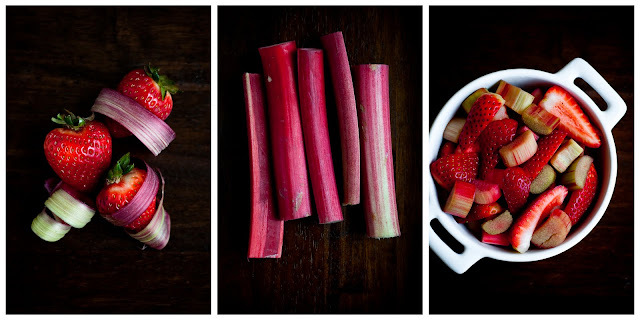 this is absolutely lovely -- i can't believe it's rhubarb season already! I found your blog through Kristen - I had to stop for a moment and just say how wonderful your photos are. 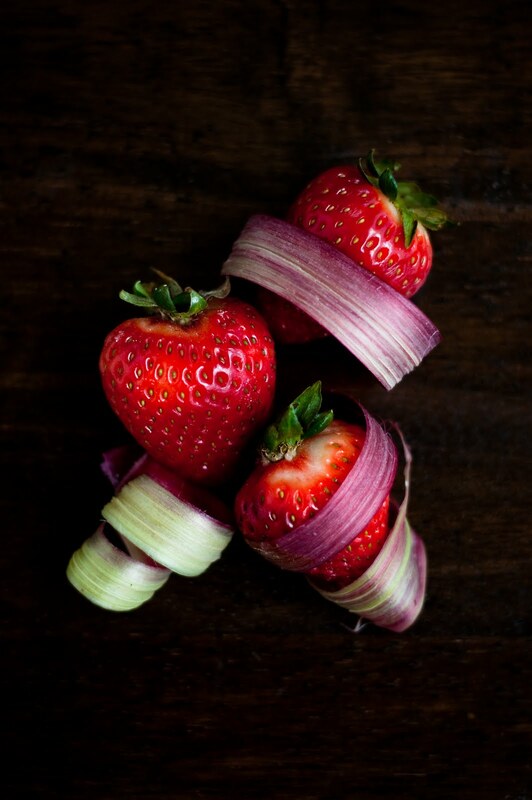 I especially love the first one, with the rhubarb wrapped around the strawberry. Fantastic :-) Now I can't wait to poke around here and see what other gems I find! Thanks! @Katy: thanks! I know--spring came around so quickly this year! Rhubarb and I have been friends for as long as I can remember: my grandpa used to cook it with some raisins and serve it next to some fish'n chips. Your photography is wonderful! 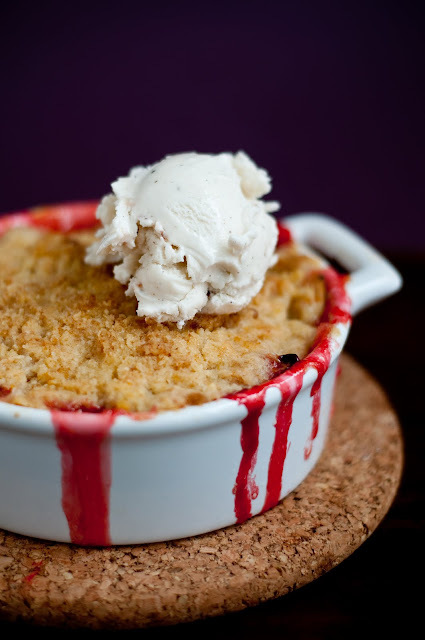 The Rubarb is now calling my name with ice cream, too! I grew up eating rhubarb because my grandma made the BEST strawberry rhubarb pie. It's my favorite to this day! I wish I had some suggestions for you, but this is rhubarb in the only form I know - with strawberry. Although, I have to say; that orange accent sounds like the perfect idea! I'm glad you finally tried rhubarb! a perfect choice for the first rhubarb. these look sensational! Beautiful photography! And I love your spoons, reminds me of the ones my grandmother had. Thanks so much, everyone, for all of your super kind comments! @Marthe: rhubarb and raisins? that sounds intriguing--I've never heard of that combination before, let alone with fish and chips! Was it a salty side or a sweet side? 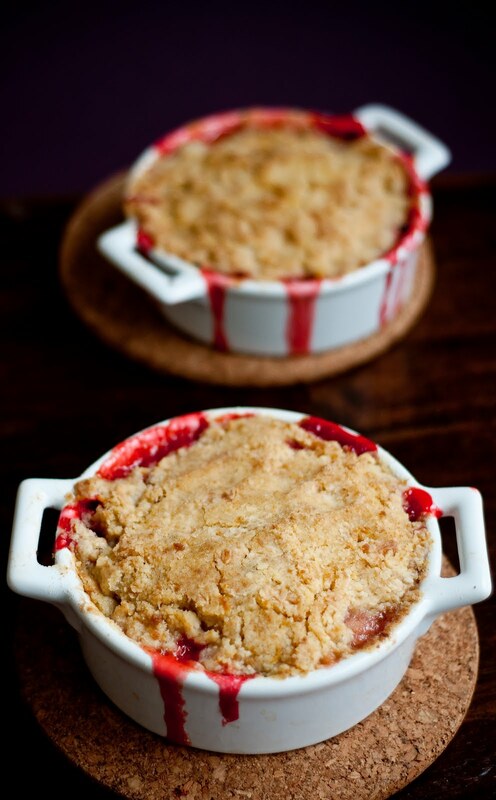 oh i am totally making this, i love rhubarb ! and i love crumbles, especially with lots of sweet topping ! gorgeous photos above, that red fruity juice dripping down, yum ! 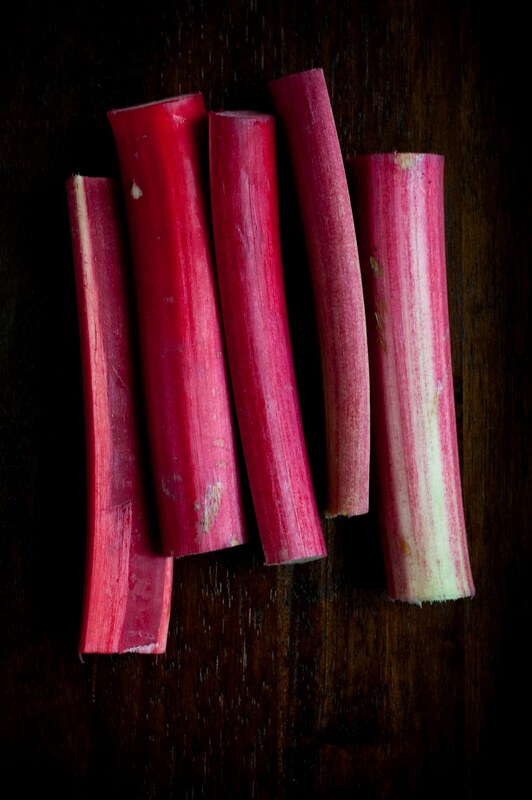 @Cheryl: If you haven't tried rhubarb yet, I highly suggest that you do. I kind of regret having waited this long myself! 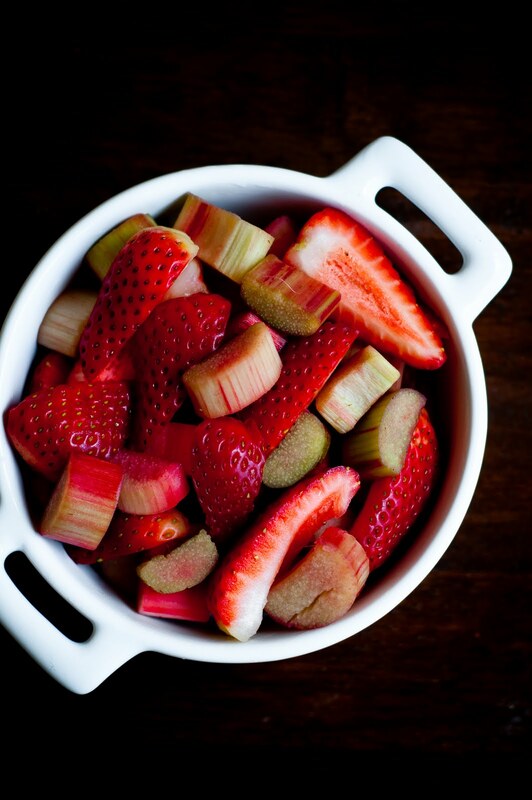 I love rhubarb! Haven't really ever cooked with it though... but I'm definitely bookmarking your recipe to try out when rhubarb cravings will appear. Looking at your beautiful photos, it will likely be very soon. Your pictures are amazing! I honestly cannot thing of a better way to use up rhubarb than pairing it with strawberry for pies, crisps, cobblers, etc, but I've heard that rhubarb can make a lovely jam as well. So beautiful! 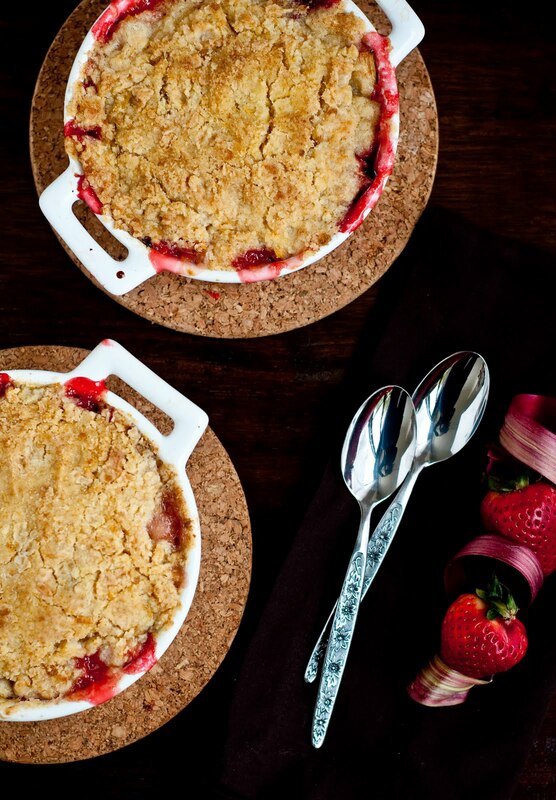 I am buying some rhubarb this week to make this delightful dessert! Our rhubarb is starting to come up. Stumbling this one! @Maria: I am so jealous that you have rhubarb growing! That looks delicious! We just got a giant box of shiny pink rhubarb in at work - there should be rhubarb sorbet and shortbread thumbprints with rhubarb jam very soon! These look mouthwatering and make me want to run out to buy fruit right away :). This looks incredible! Your photos make me want to stick a fork in my screen and take a bite!! ;o) YUM! Guess what's bubbling away in the oven right now ?! ;) Can't wait to taste. You'll have to let me know if you try those rhubarb roll-ups, so fun right ?! @Kerrin: Oh yay! Make sure to let me know how they turned out! I can't wait until I get a free minute to try the rhubarb roll-ups. They're such a creative idea. Having seen some delicious looking rhubarb nearby, I decided that I too had to try cooking with it for the first time, and I came across your recipe. I edited slightly (exchanged some of the granulated sugar in the topping for some additional brown sugar, and put in a little less than one orange-worth of zest in the whole thing. I thought it had plenty of orange flavor with just that) but it was INCREDIBLE. Beyond delicious, and everyone just loved it. My dad usually doesn't like cooked fruit, and warned me that he wouldn't eat it, but after making him try a bite he was raving about it. Thank you for the great recipe! @Yael: I am *so* thrilled that you liked it! I've also never thought to eat rhubarb raw, but your suggestion of thinly sliced rhubarb with fennel and orange sounds really good--I just might try it if there's any rhubarb left in season! This is my first time to this blog and so far I'm loving it. Gorgeous photos and great instructions. 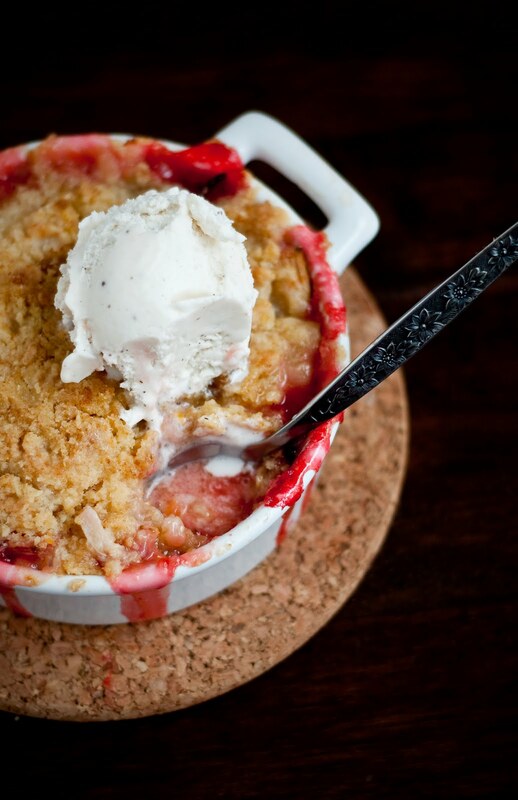 I'm putting this crumble on my to do list. I like the texture of oats, would that work with the crust? @Jenny: Welcome! I've actually made an oat crumble crust before--see here.